I have been working on setting up a more "professional" website for myself. You all have seen the blog redesign, which I rather like! 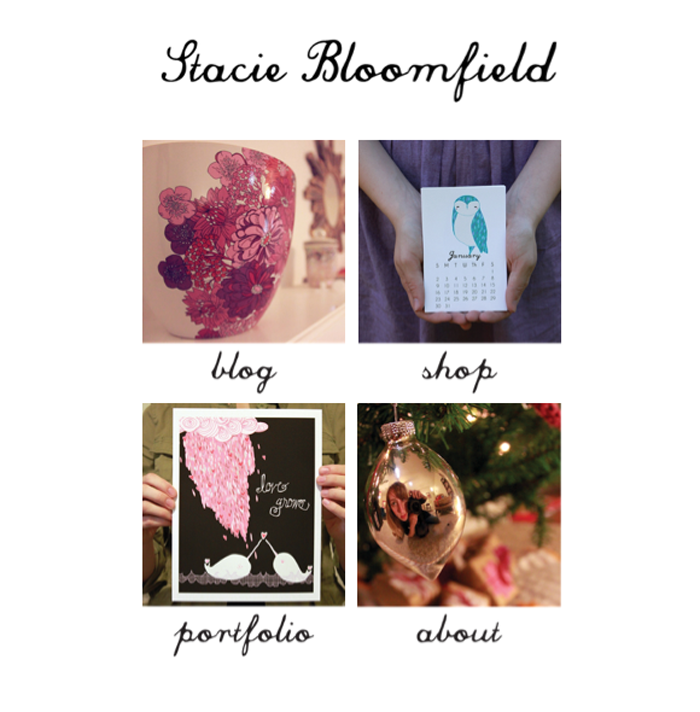 Now I wanted to show you staciebloomfield.com which will now be listed on all of my business cards and correspondence. This way all of my projects will be under the blanket of my name, Stacie Bloomfield, with links to the shop (Gingiber) the blog (GingiberSnap) and my portfolio (which is still under construction as I attempt to learn some more savvy html codes for better presentation). Let me know what you all think! I've been working like a mad woman trying to up my game. My number 1 goal for 2011 is to make Gingiber into a full time gig. I have felt such encouragement over the past few months from all of you and from my family. I want to make my dreams a reality. Who wouldn't want to be fulfilled doing something that they love? Now, I must note that I am incredibly grateful for my day job (from which I am staying home from work today, because Violet has Pink Eye). However, I find that I am most happy when I am drawing and doodling my little heart away. So no matter what, I will give 100% during the day at the university, but I devote as much time as humanly possibly to Gingiber. I recently read a fantastic blog post from Maggie over at GussySews. Wow, the girl has mad skills, not just as an artist, but her business sense is off the wall crazy good! She is like a sponge, absorbing all of the great tips and tricks available and then putting them into practice in her own business! 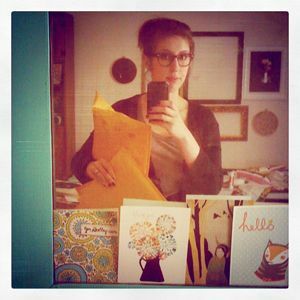 Anyways, back to the blog post, Maggie talks about Etsy vs. Big Cartel as a venue for an online shop. Now she really has me thinking about the future of my etsy shop and if I should think about changing things up a bit! Etsy has been so good to me, but in order to continue to grow as a brand, I might need to "cut the cord" and explore other opportunities. Thank you all, my sweet friends, for being with me every step of the way. I value your opinion, and am so happy to be a part of an encouraging community.